I’ve never been one to have an individual ‘favorite’ anything. Even though I’m a fairly dedicated sports fan, particularly a fairly dedicated Detroit Lion fan who’s been my team since the St. Louis Cardinals abandoned me back in ‘88, so no one can never accuse me be a bandwagoner when we finally figure this whole football thing out, I’ve never had a favorite player. I watch a lot of movies but I don’t have favorite director or a favorite actor. I might have a wallpaper of John Woo’s ‘The Killer’ on my cell phone, a movie I absolutely love, but this doesn’t mean I love all John Woo movies, just that one in particular. Japanese director Takashi Miike is one interesting dude with some people worshipping at feet of the freak while others despise the man and his work to its core. Personally I like Miike and some of his work, while I’ve found other projects of his a bit lacking. Dude makes way too many movies for all of his stuff be good all the time anyway, but since my initiation to the director was ‘Audition’, a classic by almost any measure, I had to see more. So while I enjoyed ‘Dead or Alive’ and ‘Ichi the Killer’, the DOA sequels, ‘Full Metal Yakuza’ and ‘The Happiness of the Katakuris’ I probably didn’t enjoy too much. This brings us to Miike’s ‘Sukiyaki Western Django’ which is a film that could only come from the mind of Takashi Miike, and to that end is probably a film that only Takashi Miike could make work even a little bit. Our film begins on a what looks to be a set straight out a high school play where the nasty gunslinger Pringo, played by one Quentin Tarantino who also has polarized a film watcher or two in his day, showing us what he can do with a gun. Mind you English is spoken in this film mostly by people who don’t speak English natively, yet the person I had the most trouble understanding was Quentin Tarantino. Anyway, he kills a couple desperados in spectacular fashion and I think he’s about to tell us this story we’re about to see, though his present that we’re now witnessing takes place in this movie’s past. Beats the hell outta me. Anyway, a couple hundred years into a future a dark Stranger (Hideako Ito) rides into this town that has been taken over by a pair of desperate gangs looking for the treasure that this town is rumored to possess. On one side we have the reds led by the violently uneasy Kiyomori (Koyichi Sato), and on the other side we have the unsettlingly cool Yoshitsune (Yusuke Iseya) who is in charge of the men dressed in white. Since the Stranger, who obviously handy with the steel, is also looking for the booty, both sides figure he should join up with them, but the Stranger has other plans. While in town the Stranger makes the acquaintance of Ruriko (Kaori Mamoi), the older woman with a secret past who runs the general store and fills the Stranger in on the history of the town and what has transpired since these two warring gangs entered it in search of this treasure that may or may not exist. Ruriko also carries a heavy heart as her son Akira, a former member of the red Heike, met, fell in love with and married the lovely Shizuka (Yoshino Kimura) of the white Genji clan with the two spawning the simple child Heihachi (Ruka Uchida). Akira was gunned down in front of his family while standing up to the red gang leader Koyomori, robbing his son of the ability to speak and sending his widowed wife into the arms of the White leader Yoshitsune. Eventually it would appear to us that the stranger is playing both sides to the middle, for some agenda in particular that we aren’t ever made completely clear of, leading to what has to happen in any western worth its salt, and that would a big shootout and showdown between mortal enemies with the sun high overhead. One thing that anybody who watches this movie is going to have to deal with rather quickly is the fact these Japanese characters, a large number of whom I’m guessing hasn’t spoken a lot of English in their day, speak English virtually throughout the entire movie which did make following along with what they saying a bit challenging, at least to start, but I think you’ll adjust soon enough. Besides it wasn’t like the characters were saying anything too earth shattering anyway and one probably could’ve picked up the theme of the movie in most of its entirety even if they spoke Japanese with no subtitles, especially considering that Miike is a more of visual story teller than an dialog weaver of tales. With the language barrier aside the movie settles in and similar to a lot of Miike’s films, it’s either a taste you will acquire or one that you won’t. Early on the plot is a bit complicated and convoluted. 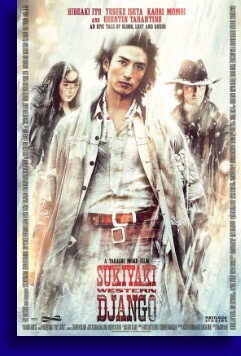 This combined with the characters odd English intonations made the story difficult to get into, but by the time Kiyomori decides to intercept Yoshitsune’s ‘secret weapon’, ‘Sukiyaki Western Django’ stops being a weird Miike flick and turns into a fairly rousing bloody shootemup style western. There is more than an passing similarity, or shall we say homage to be found aplenty to the Leone spaghetti westerns from back in the day, especially considering the suspect English and penchant towards the incredibly melodramatic. Even the score pays ‘homage’ as it more than once brings to mind the legendary musical stylings of Ennio Morricone. One thing that makes Miike the director that he is, at least in my mind, is that he has the ability to transfer what he envisions in his head directly to the screen while losing very little in the translation. Sometimes this is a good thing, sometimes it’s not, ultimately for ‘Sukiyaki Western Django’, this is a good thing as it is visually stunning, particularly the final shootout scene, which made this one of the more entertaining Westerns I’ve seen a while, not that I’ve seen that many westerns lately, despite my fondness for the genre. Recognize that ‘Sukiyaki Western Django’ will be an acquired taste, almost more than any other Miike film, but this one I managed to acquire the taste for and am glad for the opportunity to witness it in all its glory.